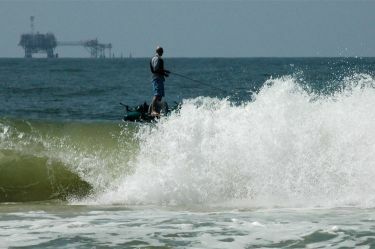 Did you know that personal pontoon boats make great platforms for surf fishing? Simply paddle through the breakers with a few quick strokes, and find the calm zone right before the waves begin to crest. Drop a “sand anchor” (which looks like a claw) to slow your drift, and stand up on your boat to fish. I use an older JW Outfitters Renegade pontoon, which is a nine-foot model. I put one foot on the seat and one foot on the small half-deck in the rear. Larger models would allow drift-boat-style standing, while smaller models might be better for kneeling (also effective: face the other way in the seat and cast over the back of the boat). With sinking, shooting or intermediate lines and flies like the Clouser Minnow or Henry Cowen’s Baitfish, or my own Fly Slama Jama, you’ll be in the small jacks and ladyfish til the cows come home anywhere on the Gulf Coast. Atlantic and Pacific anglers might see considerably bigger targets! Do you know of a way to misuse a pontoon boat to catch fish? Have tips on surfing the waves in a Clacka? Share them in the Comments section!